The bread seed, or opium, poppy is called Papaver somniferum in the botanical world. The appellations “somniferum” and “somniferous” refer to the sleep-inducing properties that can occur when certain parts of this plant are ingested. This annual flowering plant produces 4-inch white, red or purple paper-like flowers that develop large seed pods; the illegal narcotic opium is made from a milky substance harvested from the pods. 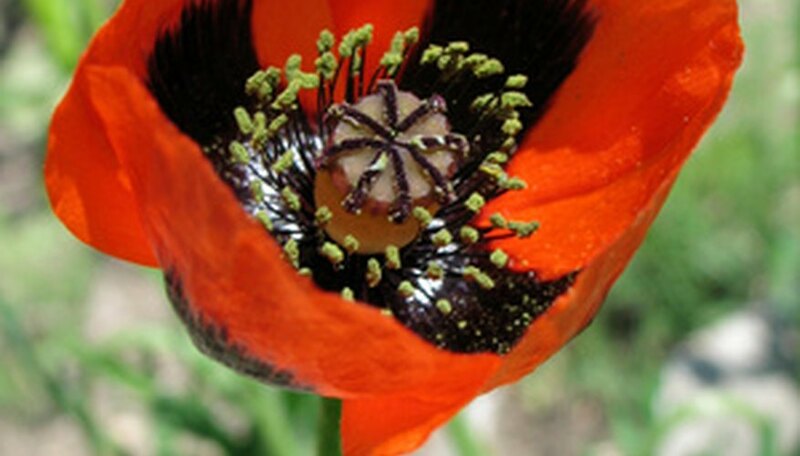 Although the drug is illegal, growing the Papaver somniferum is not. They do well as an annual plant in greenhouses. Plant seeds in fall. Fill 1-gallon or larger pots with a standard potting soil having a neutral pH (7.0 is recommended). Water your pots well, until the soil is thoroughly soaked and water comes out the drainage holes. Scatter a small quantity of seeds on top of the soil. For 1-gallon nursery pots, use about ¼ tsp. of seeds. Then barely cover them with additional potting soil and water again, taking care not to knock any seeds out of the pot by spraying your water too sharply. Place your pot or pots in a greenhouse where the nighttime temperature is between 35 to 55 degrees Fahrenheit. Install fluorescent shop lights or metal halide lights a few inches above your pots. Hang your lights so you can move them up as the plants grow; keep your lights 4 to 6 inches above the tops of your plants at all times and leave them on for 12 hours every day. Water your seedlings to keep the soil moist, but not soggy. After germination occurs, mist seedlings daily with a fine spray of water. When plants are 2 inches tall, thin out all but the strongest plant in each pot. Reduce water when flower buds begin to form and also stop misting your plants. Allow the soil to dry out before you water them again. Also, keep your lights on for 16 hours a day after flowers begin to develop and maintain a daytime temperature of 75 degrees Fahrenheit, but keep the nighttime temperature cool, as you did previously. The dried pods of this poppy are often used as an unusual accent in dried flower arrangements. This type of poppy does not respond well to transplanting, so it’s best to allow your plant to grow in the same pot its entire life.